They're thick. They're wavy. And once you pop … well, you know the rest. Did Pringles just run out of flavor ideas? Probably not. But the chip brand with a zillion funky flavors (remember the Thanksgiving-themed pack with creamed corn and green bean casserole-flavored chips?) just switched things up ... big time. 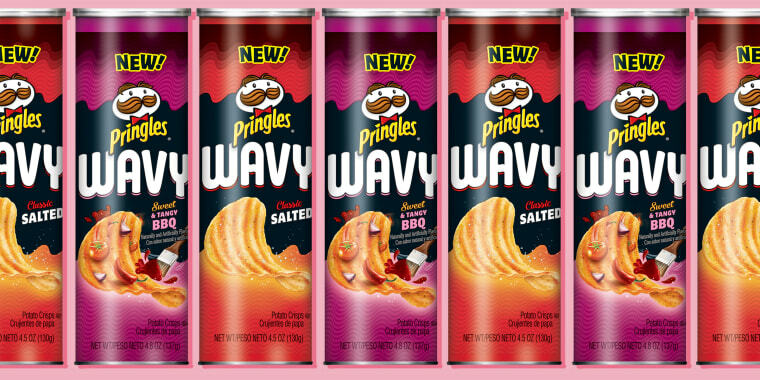 On Thursday, Kellogg's announced that Pringles Wavy chips will hit shelves in early January 2019 and continue to roll out in grocery stores nationwide throughout the year. This is the first time that the iconic curved and stackable snack will be switched up into something more wild and wavy. But don't worry, the chips will still come in a can and you can still stack them. Like Oreo, Pringles is constantly releasing new flavors. Last year, it launched limited-edition chicken ramen-flavored chips, which garnered plenty of mixed reactions (we liked them!). For its wavy line, Pringles' four new flavors sound much more palatable and, well, chip like. They will also be debuting at a time when some smoke and spiciness will be just what the doctor ordered to heat up on cold days. The new flavors are Fire Roasted Jalapeño, Classic Salted, Sweet & Tangy BBQ and Applewood Smoked Cheddar. Kellogg's is also unveiling a slew of other snacks for its 2019 roster including Cheez-It Snap'd, a thinner, crispier version of its classic Cheez-It crackers (they'll come in flavors like White Cheddar and Bacon), plus bite-sized, chocolate-covered Rice Krispies Treats called Snap Crackle Poppers.